–As I’ve always stressed up in these parts, tight labor markets are especially beneficial to lower-paid workers. –Even so, wage inequality remains alive, well, and connected to the recent boom in corporate profitability. –In earlier periods, unemployment rates as low today’s would have generated faster wage growth. The reasons for today’s under-performance are likely slack, slow productivity growth, and weak worker bargaining clout. This first figure, from my great pal Larry Mishel and Julia Wolfe, uses high quality administrative data to reveal key aspects of the real annual earnings’ story over the past few decades. 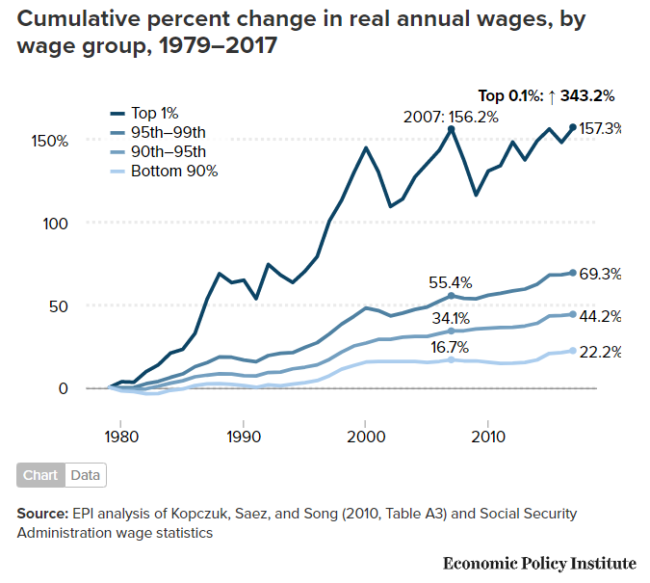 The top line shows that the average earnings of the top 1 percent—about $720,000 in 2017—are up 157 percent since 1979, compared to 22 percent for the bottom 90 percent (2017 avg: $36,000). FTR, the top 0.1 percent were up 343 percent over these years (2017 avg: $2.8 million). Moreover, and this is really telling, there are but two periods in the figure when the average for the bottom 90 goes up: the full employment latter 1990s and around 2015. The latter was a year of weirdly low inflation (about zero), so that’s anomalous. But that positive slope in the latter 90s confirms the importance to this discussion of very low unemployment. In fact, unemployment is even lower today, but I’ll get to that in a moment. The other important pattern in the figure is the sawtooth movements for the top 1 percent around 2000 and 2007. If you follow the stock market, and particularly the patterns in capital gains realizations, those spikes are familiar, but why should they show up in paychecks? The answer is that in these data come right off W2 wage filings, which include exercised stock options. The diverse pattern between the top and bottom lines in the figure underscores the narrow reach of stock market gains. –If you look solely at unemployment, you’d think the job market is at full capacity. If you look at more broad indicators, you might not be so convinced. –Low inflation tends to correlate with slower nominal wage growth, but the gap in wage growth between now and 2000—the last time we were at full employment—is only partially explained by slower price growth. –Contrary to claims by Trump’s CEA, as Larry and I showed a while ago, benefit growth can’t be crowding out wage growth, because nonwage comp isn’t outpacing wages (we showed the nonwage share of comp has been flat in recent years; we also argued, as does Ernie, that demographic change doesn’t explain the wage-growth gap). –Slow productivity is surely in the mix, but it’s only a partial explanation. Let’s pause for some analysis of that last point, as productivity is key to this debate (and key to living standards), but sometimes gets short shrift. Also, advocates of this explanation, of which I am one, sometimes argue that it is a more binding constraint than is necessarily the case. A recent paper by Janet Yellen, which Ernie cites as well, introduces a model that I’ve sort of replicated (I’m using some different data and not imposing some of the constraints she does on the model’s coefficients, though the results I’m about to show are similar if I do so). Yellen’s model includes slack, inflation, and productivity growth. 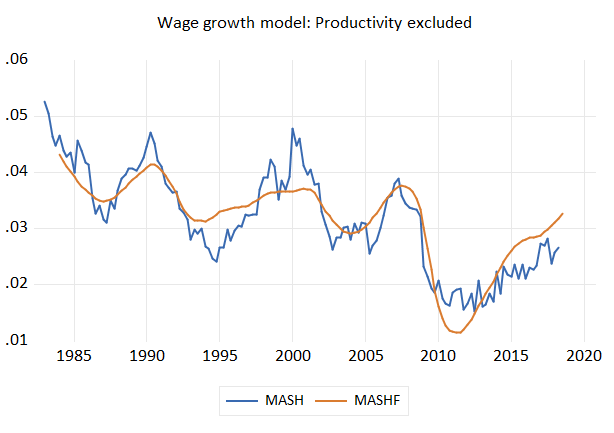 All three variables significantly drive nominal wage growth, but here’s some evidence that slowing productivity growth helps to explain the gap which is the focus of Ernie’s report. 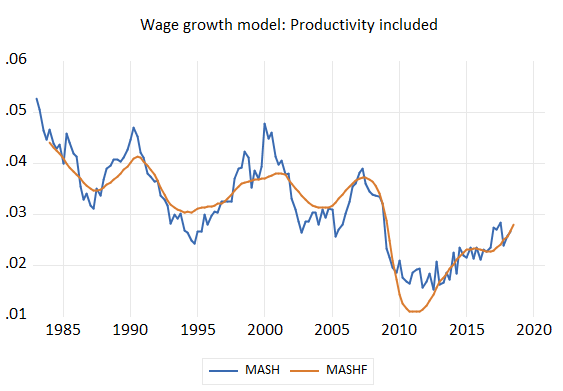 I’ve run the model using my “mash-up” wage series (five different series combined, so as to avoid cherry-picking) through 2010 and then forecasted forward using the actual values for the independent variables. The first figure shows that the model does a decent job of predicting wage growth out-of-sample. Most notably, even with the decline in unemployment (actually, the gap between unemployment and CBO’s estimate of the natural rate), this version of the model does not predict faster wage growth 8 years after the estimation period. But if I exclude productivity growth (the Yellen model employs a smooth trend in productivity growth), a clear overshoot occurs. It’s not a huge effect, for the record, but it’s there. To be clear, I could have done the same exercise with inflation and slack but economists have focused on slow productivity growth because it is, as I show in this post, an essential indicator of potential (average) wage growth, and its slowdown is therefore a real constraint on living standards more broadly. However, as I also stress in the link just above, the role of bargaining power must not be overlooked in this productivity discussion. Even at low productivity growth, wages can grow more for some groups than others (distribution within the national wage share of income), and the wage share of national income, which has tanked in recent years, can rebalance in favor of workers. In fact, that dynamic is attractive from the Fed’s perspective, as it supports non-inflationary wage growth. 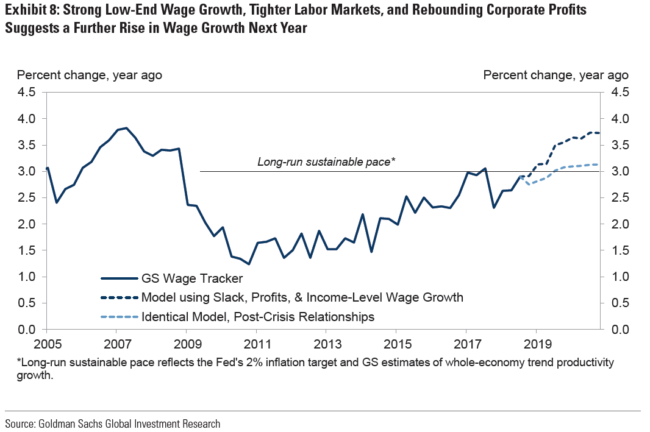 The final recent wage report to bring to your attention comes from researchers at Goldman Sachs (no link); it focuses on the distribution of wage pressures as the job market tightens up. Their table below makes a point I’ve long stressed: the less you earn, the more tight labor markets help you. The coefficient on slack (top row) is 2x that for low-wage as upper-middle-wage workers, and it is insignificant for high-wage workers. Note also, as in the Mishel/Wolfe chart above, the correlation between corporate profits and high-wage growth. The other important finding from their regressions is the structural downshift of the model’s parameters in the post-2010 period, though not for low-wage workers (state minimum wage increases are likely in play here). The last figure shows that using the parameters from their full model predicts average wage growth close to 4 percent by late next year. But if the prediction is made based on the more recent, diminished correlations, then wage growth hardly budges from its current pace, even as they predict the unemployment rate to fall significantly below today’s levels. Putting it all together, tight labor markets are as important as ever, though slow productivity growth and weak bargaining clout are still, even at 3.7 percent unemployment, operating as wedge between growth and broadly shared prosperity. The policy implications point towards the importance of patience at the Fed and more collective bargaining (and much better labor policies, including minimum wages/overtime, but that’s for another post). Workers need both tight labor markets and the power to steer more of the benefits of a full capacity economy into paychecks, not profits. Share the post "Wage roundup: Amplifying new work on an important topic." 2 comments in reply to "Wage roundup: Amplifying new work on an important topic." What about abandonment of antitrust, excessive concentration and monopsony?